Immunoprecipitation is a method for purification and enrichment of target protein by based on the specific reaction of antigen and antibody. Antigen (target protein) from samples combined with specific antibody will lead to antigen-antibody complex formation, and then, the antigen-antibody complex will be purified through binding to agarose beads which are coupled with Protein A/G or secondary antibody. The purified antigen-antibody complex could be analyzed by SDS-PAGE, Western blotting, mass spectrumetry and etc. to purify the target protein, and detect the protein qualitatively. 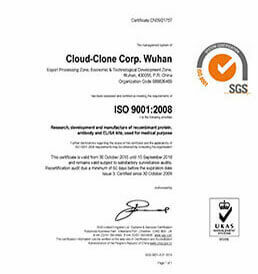 Cloud-Clone Corp. can provide one-stop service for part or the whole of immunoprecipitation experiments, such as the preparation of antigen and antibody, the preparation of positive sample, the treatment of tissue and cell lines, conjunction of protein A/G or secondary antibody to agarose beads etc. 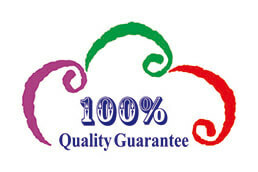 A variety of experimental protocols could be provided according to the requirements of the customers. 1. Preparation of antigen or antibody. 2. Preparation of the positive sample (including cell culture, cell stimulation, cells transfection, animal models, etc.). 3. Conjunction of Protein A/G or secondary antibody to agarose beads. 4. Analysis of SDS-PAGE, Western blotting, Mass spectrometry, etc. 1. Provide the cell or tissue lysate, etc. (Detailed technical solutions need to be provided for preparation of special samples, infectious samples have to be marked). 2. Sample treatment service is provided for fresh samples of cells or tissues. 3. Samples can be customized from Cloud-Clone Corp. (including cell culture, cell stimulation, animal models, tissue preparation etc.). 2. Customized samples, according to customized service period. Analysis of target protein Including SDS-PAGE, Western blotting, Mass spectrometry, etc. Remarks: For "optional" option, customers can choose different experimental procedure according to the requirements. 1. The complete experimental protocol. 2. All the experimental data (including picturs).3. 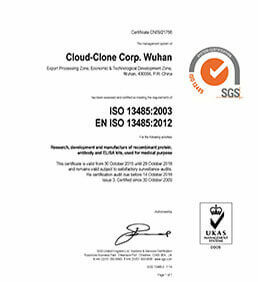 The remaining reagents and samples bought or customized from Cloud-Clone Corp.